Here, folks can browse two Aroma 6 cup rice cooker models that both perform well and prepare good quality rice and steam food. One is a Micro-computerized unit, the other is a more basic cooker. 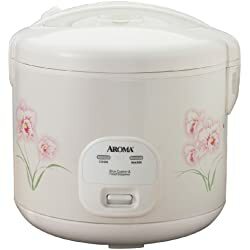 This Aroma 6 cup rice cooker is currently one of the best overall models offered by this company as it brings a lot to the table and does more than simply boil rice. This Aroma rice steamer cooker uses Sensor Logic technology which is specifically programmed to monitor how the rice is cooking. With this in your corner, the machine makes fine temperature and cooking time adjustments resulting in better quality white and brown rice dishes. Aside from that, the Aroma ARC-856 also doubles as a slow cooker and vegetable steamer making it a neat little multi-tasker and worth the price tag…which is reasonable considering for what this 6 cup rice cooker offers. Currently we rate it as a Very Good cooker that folks should find useful in the kitchen. This next Aroma 6 cup rice cooker is more on the basic side, but should not be strongly considered over the above model since there is a moderate price gap separating the two. Not to say that folks should skip this cooker completely, but for those who plan on using their rice cooker frequently, and even more so plan on cooking white, brown, and sushi rice types, the above model is a better choice. However, for folks who prefer the basic set and forget cooker that is good for just making white rice in less time (longer cook times with above ARC-856), this cooker is not a bad choice. Granted we did hear of some small little cons folks have reported, but overall, this 6 cup rice steamer cooker is worth the low price tag and as just mentioned can simultaneously prepare steamed food as the rice cooks below. A nice sized rice cooker for a household of 4 to 6 people. 6 Cup rice cookers are not as common or popular as the slightly smaller 5.5 cup rice cooker models, and only one thus far that we have come across offers folks a micro-computerized model. Aside from the Aroma 6 cup rice cookers mentioned on this page, we also recommend folks check out the Zojirushi NHS-10 6 cup cooker. However, before spending the money on any 6 cup rice cooker, please feel free to check out the wider selection of 5.5 cup cookers located on the “Best 5 Cup Cookers” tab.